It's not hard to argue that the Reds 2012 season was defined, for better and worse, by the health of their starting pitchers. The Reds regular season success was driven by a rotation that was the very picture of health, while the Reds postseason was undone by an untimely injury to Johnny Cueto. Given the obvious importance of pitcher health to the fortunes of this team, it's worth the time to take a look at the shoulder injuries that have plagued Johnny Cueto. When I first gave thought to Cueto's adoption of a Luis Tiant type coil, I thought it was more of an overnight change. Something he picked up and incorporated prior to the 2012 season. 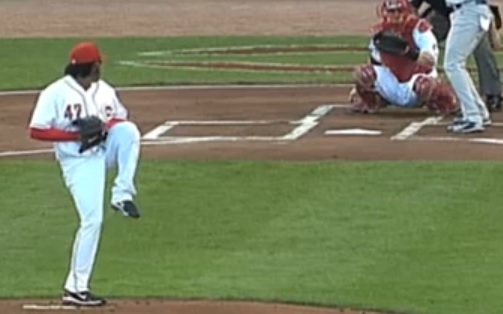 However, if we look at Cueto's position at the apex of the leg kick since he first arrived in the league, it's clear that that's not the case. It was actually a gradual evolution. 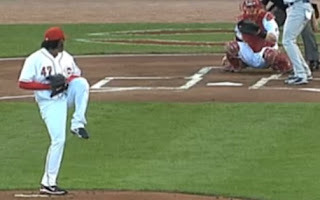 As you can see, his leg kick at apex is pretty conventional (and, the quality of the video from 2008 is poor!). He brings his leg up past parallel and has minimal coil. There's very little leg wrap at apex. His leg kick in his second season is substantially the same as it was in his first year. Again, he's up past parallel with minimal body coil. And, there's still minimal leg wrap at apex. Note that there is little differential between the line of the hips and the line of the shoulders, both run basically on a line from 2b-to-homeplate. Now, you can start to see more body coil at apex. His third year in the majors has brought some mechanical changes, as he has started wrapping his leg at apex. 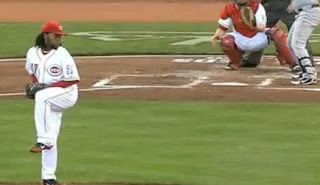 His knee is no longer pointed at third base, but is pointed more towards the third baseman or maybe even the shortstop. The benefit of the leg wrap is that it creates a differential in the rotation of the hips and the rotation of the shoulders. This differential creates tension in the spine that can increase the force generated by the windup. That differential was not present in his 2008 and 2009 mechanics. So, this version of his mechanics is arguably more efficient, as it potentially generates more force with the body. Force that does not then have to be generated by the arm. You can, again, see the difference, as he has again changed his mechanics to incorporate even more body coil. 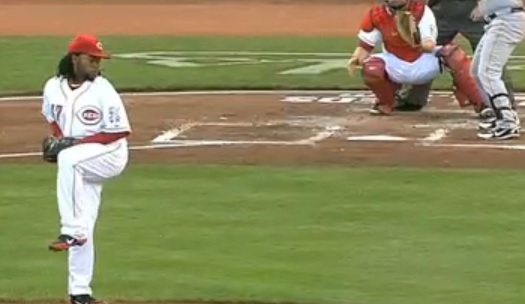 His leg is wrapped even farther, pointing almost at second base instead of at the third baseman/shortstop. Despite the increased hip rotation, the differential between the rotation of the shoulders and hips has likely decreased because of the increased rotation of the shoulders. In short, his 2011 set of pitching mechanics is arguably somewhat less efficient than his 2010 mechanics, reducing the potential force generated by the body and, consequently, increasing the force that has to be generated by the pitching arm. Finally, in his fifth season, Cueto evolved into his current version. His body coil is now massive. Not only does he have substantial wrapping of the leg, with his knee pointing at second base, but he also uses significantly more shoulder rotation. In 2011, he used a significant degree of leg wrap, but the shoulders stayed in a more traditional position. In 2012, he started rotating his shoulders so far that he showed his back to the hitter. Maybe he wanted to remind the hitters exactly who they were facing. Or, maybe he thought there were benefits to be reaped in deception and gathering his momentum before driving to the plate. Whatever the reason, the transformation was complete. My initial impression of these pitching mechanics was that they would be very hard on his right knee. The rotating of the hips and upper body against the planted, stationary right leg seemed likely to create significant stress on the right knee. That concern never materialized, but the shoulder problems certainly did. The mechanics here are essentially the same as the 2012 version. The interesting thing is that, in one respect, Johnny is right back to where he started: minimal differential between his hip and shoulder rotation. Early in his career, he had limited differential because the line of both his hips and shoulders at apex ran from 2b to homeplate. Now, he has limited differential because the line of both his hips and shoulders at apex runs from 1b to 3b. In one respect, he's gone from "inefficient" (2008 & 2009) to "efficient" (2010 & 2011) and right back to "inefficient" (2012 & 2013). The only tension created by his current body coil is against the right knee. However, that doesn't provide the same kinetic chain benefits as mechanics that create tension in the spine through a substantial differential, both at apex and after the stride, between hip rotation and shoulder rotation. The latter reduces stress on the arm because it permits a delayed shoulder rotation that results in the pitching arm being pulled through the delivery by the force travelling up through the hip rotation to the spine to the shoulder rotation. 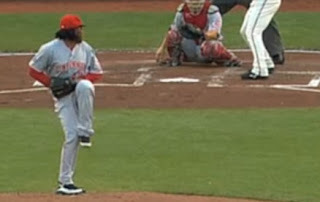 The real problem with using a twisting motion that coils up against the right knee, as Cueto does, is that it precludes the effective operation of the kinetic chain by forcing the hips and shoulders to move in tandem. If they move in tandem, then they have to uncoil at exactly the same time, making it very difficult to delay the shoulder rotation and thus necessitating that a greater percentage of the force imparted to the baseball be generated by the pitching arm. That could be a reason for the increased arm injuries. 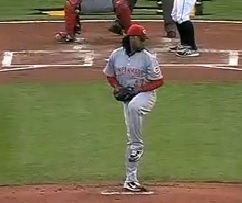 In hindsight, it's obvious that Cueto's body coil wasn't an overnight change, but rather a gradual evolution. His first two seasons (2008 & 2009) involved minimal body coil. He started incorporating more coil in 2010. It got even more severe in 2011 before reaching its current form in 2012 and 2013. Now that we can see the gradual evolution, the question is whether the Luis Tiant move has resulted in increased performance benefits and/or heightened injury risk. Thanks to the injury history on the brilliant Baseball Prospectus player cards, we can review his specific injury problems. 8/16/2009 -- Right shoulder inflammation, missed 15 days. 3/22/2011 -- Right shoulder inflammation, missed 47 days. 9/15/2011 -- Right shoulder strain, latissimus dorsi, missed 14 days. 10/7/2012 -- Right abdomen strain, oblique, missed 5 days. 4/14/2013 -- Right shoulder strain, latissimus dorsi, missed 36 days. 6/1/2013 -- Right shoulder strain, latissimus dorsi, missed 15 days. 6/29/2013 -- Right shoulder strain, latissimus dorsi, missed an as yet to be determined number of games. Given that he started incorporating more body coil in 2010, which started getting more severe starting in 2011, it's not inconceivable that his shoulder strains are related to his twisting body coil. The increasing frequency of his shoulder strains certainly seemed to correspond with the increasing severity of his twisting body coil. Causation? Or, merely correlation? Unfortunately, it's impossible to know for sure. His performance level throughout his career has been fairly consistent, though it does improve a tick over time. But, is that a result of changing mechanics? Or, just gaining more and more experience at the MLB level? The biggest area of improvement in his peripherals is the ground ball rate. That seems more likely to be the result of a shift in pitch mix, focusing more on the 2-seamer down in the zone than the 4-seamer up in the zone, than any mechanical change. At this point, it's difficult to conclude that the twisting body coil is directly tied to his success. My biggest concern would be if the twisting action creates better movement on his pitches. Even so, if the shoulder/back injuries require it, he should be able to alter his mechanics and still maintain a high performance level. Cueto is an experienced Major League starting pitcher and there's no reason he can't continue to evolve in his pitching mechanics, incorporating a bigger differential between the rotation of the hips and the rotation of the shoulders, to reduce his injury risk. A return to the pitching mechanics of 2010 would likely do the trick. As it stands, his current pitching mechanics undercut the effectiveness of the kinetic chain, requiring his arm to work harder to generate the force for the pitch. At some point, the Reds season may again come to rest on the right shoulder of Johnny Cueto. Let's hope it proves up to the task. If not, it'll be time for mechanical changes.